SQUIDALICIOUS: Leo Turns Our Car Into an iPad! 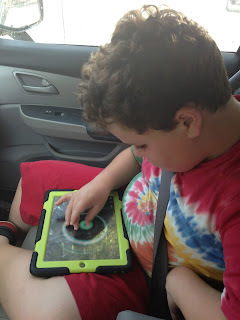 Once again, you win "best mom ever" because I cannot handle ipad sounds.. but maybe if it was played over the car stereo instead of the tinny iPad one I would be able to tolerate it? hmm must investigate! Which van did you get? We are heading into the senior years of our Nissan Quest - feel like it's going to die someday soon. We have loved it, but not sure what to get next. @Becky, Honda Odyssey. A fine vehicle.